Regular readers of this blog will know that circumstances have led me to spend my summer in a remote mountain village without media. Oh, media is here, via satellite dish but not that I can access easily. Deprived of my usual sources of information (except old National Geographics -1985!! ), my conversation has fallen back on old timey tales. 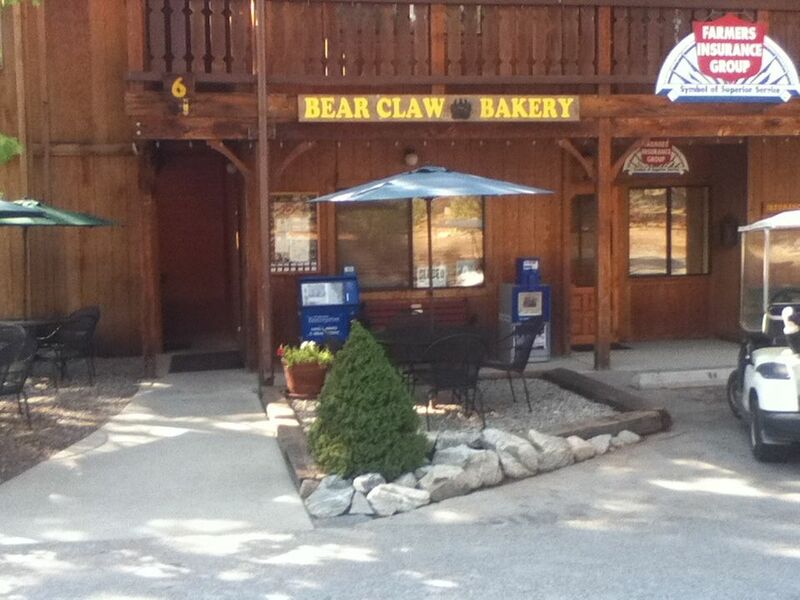 This morning four of sat outside the Bear Claw bakery toasting in the 8 a.m. sun, eating the best croissants outside France and telling such tales. There had been a terrible lightning strike at Venice Beach the previous Sunday. One of us had been near the beach that day, but not actually at it and had witnessed the brief violent storm. Julia piped up and said that when you are near ground zero, the flash is a sheet of light. She recounted being in the family room of our house under the hill in Scarborough when lightning hit the flag pole above. I have amnesia about lightning mostly. When I was a toddler and sleeping upstairs, a ball of lightning came in one window, streaked over my crib and out the other. I leaped out of my crib and hit the stairs running. Just as the horrible thunder crashed, I slipped in my pajama feet and soared into space. I fell –into the waiting arms of my Uncle John – infinitely slow John Cunnington who had heard me, sprung up from the table, flung open the stairway door and caught me. That was it for me – memory wise. The file marked lightning was full. But Julia had other memories from her sailing childhood. 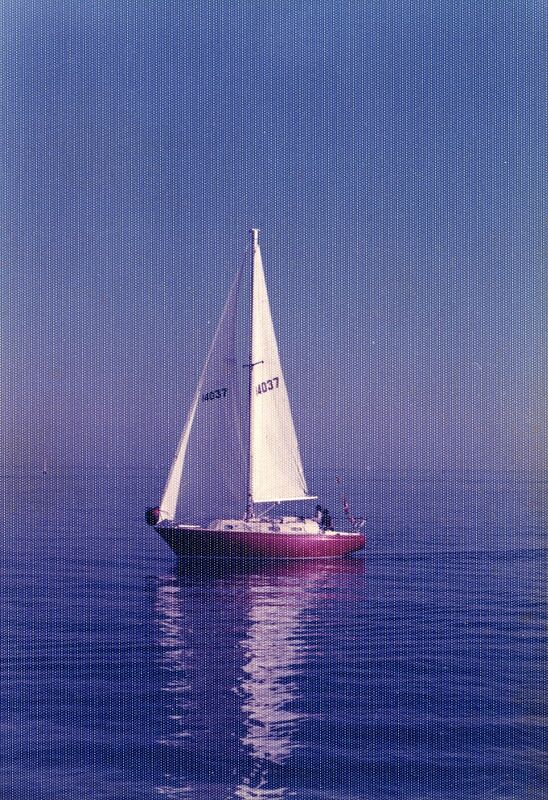 When she was 14, her father, Blake and I bought a Northern 29, a sailboat designed to sail in the narrow North Sea, where the waves come close together. It has a lead keel, which renders it very stable, indeed capable of righting itself should it turn over. It was a good choice for Lake Ontario which is also narrow and prone to similar waves. It has a steel mast that is set in the lead keel. This means that lightening strikes should go down into the lead and disperse over the water. The fourth member of the crew was her 13 year-old brother, Daniel. Julia thinks that it was Blake’s wartime experience that made him want to sail. He was evacuated with many other children on the ship, Antonia, to Canada. At least one such ship, The City of Benares had been torpedoed with the loss of 77 children.There were two other ships carrying children in Convoy Z in which Antonia sailed, a total of 1000 kids. There were 6 destroyers protecting the convoy and the Battle ship Revenge, which as it turns out was carrying Britain’s gold reserve £10 million to safety in Canada. Blake was 5 at the time. He was 10 when he made the relatively safe return after V.E. Day. For whatever the reason, we found ourselves press-ganged into the crew of the red sailboat, Sirocco. Mostly we were self-taught sailors, although Blake took a night course to qualify as skipper, learning such things as right of way rules, how to understand lights and buoys and so on. He had also read avidly. But the first time we flew the spinnaker, none of this helped. The spinnaker is that balloon-like, colorful sail that flies out ahead of the boat when it is sailing downwind (the wind is behind). Ours was colored like a rainbow. It is attached the mast near the bottom and then pulled up by a pulley until it is secured at the top. Meanwhile, two lines (ropes) are threaded through winches so that the crew can trim it according to the wind. The object is to get it ballooning out in front. Blake had the sail up and Julia was on the foredeck holding one of the thick rope lines not yet secured through its winch. Suddenly the halyard at the top let go and the wind carried the huge sail straight out ahead of the boat. Julia hung onto the line as it ripped through her palms at high speed. She was screaming in pain but determined not to lose our most expensive sail. “Let it! Let it go!” he father shouted. She did. The sail puffed once and sank through the air into the water. I ran to Julia. Blake ran to the bow. Daniel grabbed the boat hook. Julia’s hands were raw and beginning to bleed. Daniel and Blake were leaning so far out that it looked as if they would join the sail in the water, but a minute later they were back up pulling in the bedraggled mass of the sail. Glorious in flight, sodden and unlovely as a swimmer. Sirocco was about 2 years old when we bought her and the sails were still reliable, but by the second summer, the main sail was showing wear. There is a saying that owning a sailboat is like standing in a cold shower tearing up money, so we hadn’t got around to ordering a new main sail. Typically, we would study the weather report that summer and learn that here was a chance of an afternoon storm. Since the storm hadn’t materialized for at least a week, we went sailing. Sure enough, it arrived. Blake had shortened sail by putting up the smaller jib instead of the bigger genoa. We sail trimmers were working attentively keeping just the right amount of air in it. From time to time, Blake leaned over from the tiller and adjusted the main on its track along the boom. The wind began to pummel us in great gusts. A huge boom like thunder right above us rent the air. We looked up to see the main sail loudly flapping. It had blown out into two pieces. Just sailing wasn’t enough. We raced Sirocco. Not only did we race it around the yacht club bay, we raced it across Lake Ontario, sometimes in two day races. Thus we were treated to a close study of lightning. One day during such a storm, three of us were in the cockpit steering and trimming the sails. Daniel was having a break down in the cabin, probably reading. He was sitting on the banquette beside the table. Our budgie’s cage was fastened with a bungie cord to the ceiling and the floor. They were both inches from that steel mast. As those of us up-top tried to keep the boat from swamping, water crashed over the gunwales. It is reported that I shouted, “I wish you’d tell that guy who’s throwing buckets of water in our faces to stop.” Suddenly, Daniel called up, “What does it mean when the mast glows blue?” “Don’t touch it!” three of us yelled in unison. Silence fell. He was alive. What about the bird? Then we heard a very clear chirp. One day on the St. Lawrence River, Blake nonchalantly wondered why there was a large, orange bleach bottle floating in the water. A second later, with a crash like thunder, Sirocco hit a rock. Everything flew forward and bounced back, including hapless humans. “Is there a hole? Is there a hole?” we shouted. Daniel, who had once again been below, had to dig himself out of the cabin debris and crawl into the fore-cabin. “No hole,” he shouted back. Shaking so hard I could barely stand, I joined Julia and her father on the aft rail, about 4 inches wide and we began the time-honored rocking back and forth employed when you are hard aground. Daniel crawled out and joined us. The boat didn’t budge. But what is that crazy motor-boater doing. He is driving around us, faster and faster in tight circles, each circle building a higher wake. Finally, one big one lifted Sirocco and we floated clear. Our rescuer waved and raced away. I served juice. Eventually, we all stopped shaking. Daniel was not always below. He was the one who leaped onto the dock as we came to tie Sirocco up. (Blake invariably sailed in rather than using the motor.) One night at Niagara-on-the-Lake, Daniel missed the dock and fell between it and the boat. There was a mad rush to fend off so that he wouldn’t be crushed between the ton and a half boat and the dockside. The waters of the Niagara River come rushing down over Niagara Falls and down the rapids and roil out into Lake Ontario. On a stormy day, the waves of the lake collide with the rush of the river and create a sort of vortex of water. On one such day, I had my personal safety line hooked onto the boat’s safety lines. So did Daniel, but he got tangled up as we worked on the fore-deck trying to take in the jib. Impatiently, he unhooked it. He had both arms full, struggling to control the canvas. He stuffed it down the hatch and stood erect. A crosscut wave hit us. Daniel fell backwards as the boat leaned. His body was entirely over water. I grasped both his wrists, braced myself and hung on, staring into his face. Suddenly, the boat heeled again and he fell into my arms. Clara, who was listening to these stories, said after each one, “And then you quit sailing.” Of course we didn’t. Were we addicted to the adrenal rush or the tranquility of a flat sea at evening? Blake sailed for the love of sailing. Perhaps we sailed for the love of Blake.